Get Travel Directions for This is Beauty. About - This is Beauty. 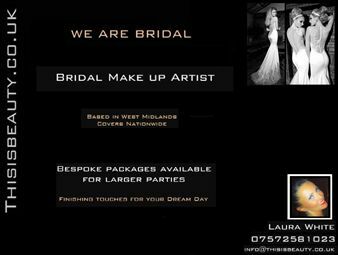 -Freelance Make up Artist, specializing in Bridal, Glamour, Photographic, Special occasions and Fashion. 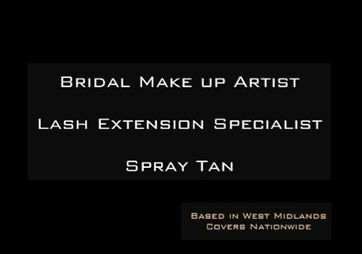 -Mobile Spray Tan Technician based in West Midlands, Covers Nationwide. 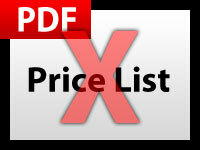 Bespoke Packages for Bridal Parties, Proms and any other Special occasion. All Treatments in the comfort of your own home/destination of choice. 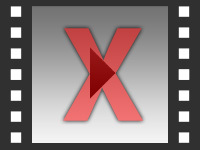 Find out how to promote This is Beauty. quickly, simply and for free. Enter your email address and message to This is Beauty. and we will pass it straight on for you. There is currently no customer feedback for This is Beauty..
To pass feedback onto This is Beauty. you need to either Sign Up or Log In.